While certification is a requirement for many European countries, it is not required for riding instructors in the United States or in Canada. Certified riding instructors teach students about horse behavior, how to get results from horses with different personalities, and they know how to evaluate rider positions and techniques when they're saddled up. More importantly, they can make riding fun for the student and match up a rider with the right horse. If these factors are important to you, then you may want to consider becoming certified. There are quite a few options for anyone who wants to enhance their credentials. While this isn't a complete list, here are some of the best-known certification programs for riding instructors. The American Riding Instructors Association (ARIA) certifies riding instructors in 15 different disciplines including distance riding, dressage, driving, eventing, hunt seat, hunt seat on the flat, mounted patrol training officer, recreational riding, reining, foxhunting, saddle seat, show jumping, side saddle, stable management and western (pleasure & equitation). The initial certification in a discipline costs $595 and consists of oral, written and practical tests. This portion involves the candidate’s submission of a skills video on DVD. Re-certification is required twice more in the discipline at 5-year intervals, and this renewal course is offered at a cost of $350 each time. Being an ARIA-certified instructor gives you nationally-recognized credentials and puts you in the Directory of ARIA Certified Instructors on the organization's website. The Certified Horsemanship Association (CHA) was established in 1967 and has certified more than 30,000 riding instructors, barn managers and trail guides. The organization offers a 3-year certification after completion of a week-long clinic. 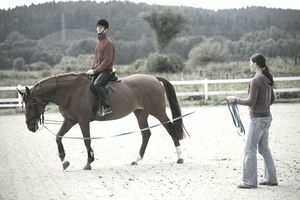 During the clinic, the candidate must pass written tests, riding evaluations, practice lessons and attend seminars. Instructor certification is available in a variety of specialties including English riding instructor, Western riding instructor, trail guide instructor, equine facility management, vaulting instructor, driving instructor and instructor for disabled riders. A certified instructor must also complete at least 25 hours of continuing education credit every three years to keep their certification current. Initial certification through the CHA costs around $200 and re-certification is $75. Yearly memberships are $60 and lifetime memberships cost $750. Centered Riding, a program founded by Sally Swift, offers 4 levels of certification for its member instructors. Level 1 and 2 instructors are qualified to apply the principles of centered riding within their discipline. Level 3 instructors are qualified to teach open clinics. Level 4 instructors can teach open clinics, instructor courses, and instructor update clinics. To begin the certification path an instructor must have at least 1 year of teaching experience, meet riding skill requirements, participate in at least one open clinic and complete a 7-day certification course. Costs may vary based on level and where the course is taking place. The Professional Association of Therapeutic Horsemanship International (PATH International) offers certification to therapeutic riding instructors who work with special needs riders. The organization was founded in 1969 as the North American Riding for the Handicapped Association. The group has more than 880 member centers and more than 8,000 members around the world. These members support more than 66,000 people with special needs in horse-related activities and therapeutic programs. Three levels are offered for therapeutic instructors: registered, advanced, and master. PATH International also offers certification for vaulting instructors and driving instructors. The certification process involves submission of 25 hours of teaching video, obtaining current CPR and first aid certifications, and attending a multi-day on-site instructor workshop and certification class. The application fee for the PATH International certification program is $65. Continuing education credit hours and CPR/first aid renewals are required each year to maintain certification. The U.S. Dressage Federation (USDF) offers an Instructor/Trainer program for the discipline of dressage. The three certifications available are training/first level, second level and third/fourth level. A pre-certification course is available and serves as a practice exam and critique for those seeking certification. Certification requirements include USDF membership, a minimum of three years of teaching experience, current first aid certification, letters of recommendation from industry professionals and attendance at a certification class. Successful applicants must achieve 70% or higher in each area of the certification exam. Certification through the USDF costs $750 for the training/first level exam, $750 for the second level and $650 for the third/fourth level exam. Sixteen hours of continuing education credit are required each year to maintain certification. The U.S. Hunter Jumper Association (USHJA) offers a trainer certification program for the discipline of hunt seat riding. Certification involves passing a written exam, attending a trainer certification program clinic (or completion of the online option) and having three years of prior experience as a trainer/instructor. Provisional trainer status is available for those who have not yet achieved the three years of required experience. The application fee for a USHJA license is $100 and the exam fee is $225. The online course is available at a cost of $200 and consists of 5 hours of videos and quizzes. The online option also includes a six-month subscription to the video library at EquestrianCoach.com. The association will approve the application and send an email log in code with your exam credentials. In order to receive certification, you must pass with at least 85% or higher within six months of the time the exam email was sent. Certification must be maintained and updated once every five years. The British Horse Society (BHS) has more than 100,000 members in the U.K. It was founded in 1947. The BHS offers a widely respected certification path for instructors. Certification requirements include several levels of basic competency evaluations and providing documentation of training experience. The first level is BHS Assistant Instructor, followed by BHS Intermediate Instructor, BHS Instructor and ultimately the rarely achieved the highest level — Fellow of the BHS. All certification candidates must be BHS members and pay significant examination fees for each level. Costs for coaching certification courses range from £350 to £600. There are several benefits to being a certified riding instructor. First is safety. Many people who have taken courses to become certified are able to give riding lessons safely because they have gone through certain safety measures and processes. Secondly, certified trainers may command a higher price compared to someone who isn't. A stable or farm may be more likely to hire someone with certification because that may mean more money for their business, too.